If you have tried cleansing, and have done a bit of research in what are the natural ways to do it, you might have encountered a botanical called Buckthorn Bark. From what plant does it come from, what are the health benefits, and how does it exactly help in ridding the body of harmful toxins? Read on to find the answers. Native to Europe and some parts of Asia, Buckthorn Bark comes from the Alder Buckthorn tree. Before it’s harvested during summer, the bark has to age at least a year. This is important because the younger the bark is, the stronger and harder it is for our digestive systems to ingest and process. Also known as Alder Buckthorn, Alder Dogwood, Black Dogwood, and Glossy Buckthorn, Buckthorn Bark was used in Ancient Greece for protection and remedy for poisons, headaches, witchcraft and demons. Later, by mid-1600’s the botanical became recognized as treatment for constipation, and in the early 1800’s it was officially recognized in the US as a drug for the same ailment and other bowel disorders. Buckthorn bark assists in the body’s natural detoxification process. The go-to natural remedy for constipation and other digestive issues has anthraquinones which have natural laxative properties. One one hand, these compounds help shape stools into larger, softer volumes, effectively easing bowel movement. On the other hand, anthraquinones increase motility in the colon as it aids in reducing water consumption by the intestines. Additionally, anthraquinones have also been found to have antibacterial properties, helpful in flushing out damaging toxins. 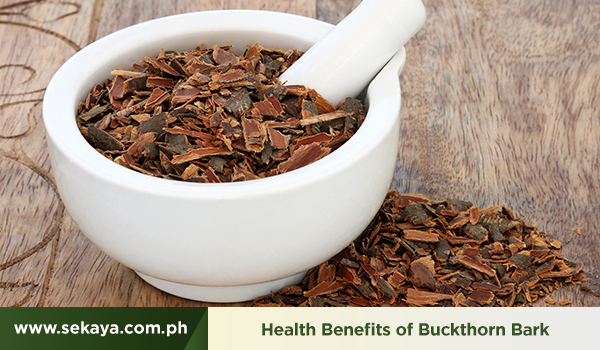 Experience the natural health benefits of Buckthorn Bark in a subtle, earthy brew of Regular Move. An infusion of medicinal botanicals Burdock Root, Dandelion Root, Marshmallow Root, Ginger Root and Buckthorn Bark, Regular Move is a functional blend that supports natural relief from constipation and other digestive concerns. Have your healing cup of nature’s wonders with Sekaya Botanic Infusion.